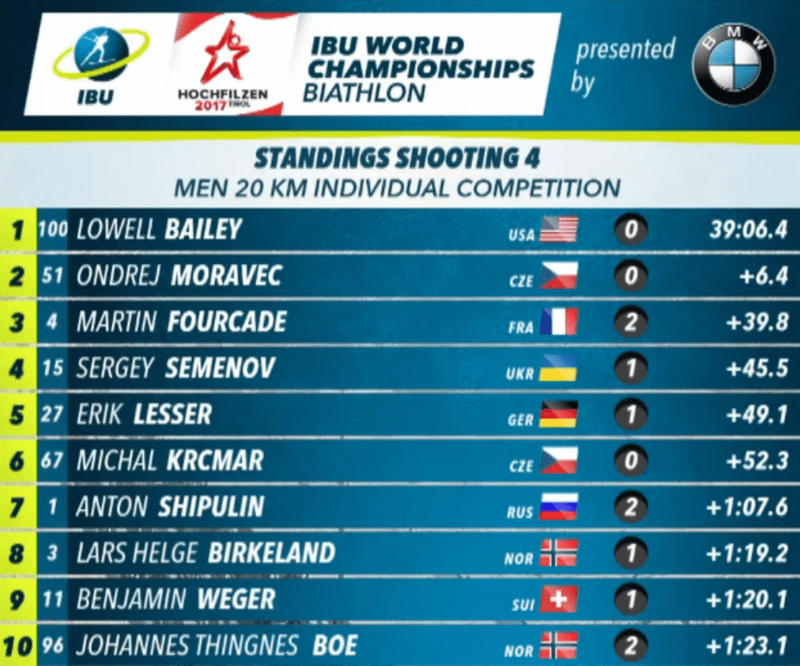 Young American biathletes can find great inspiration in the performance of Lowell Bailey at the 2017 World Championships in Austria. 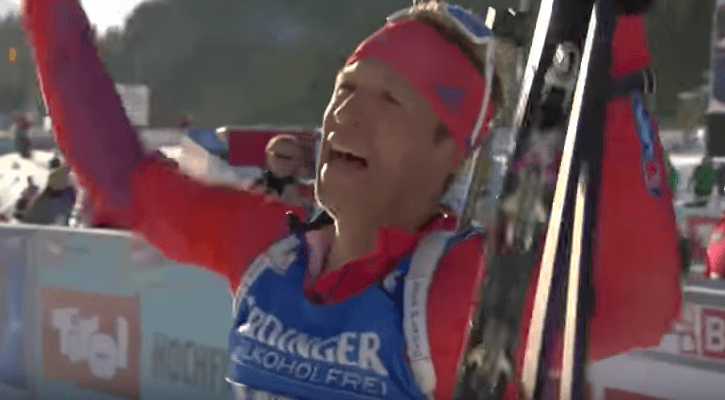 Watch him win the first-ever World Championship gold for the United States by shooting clean and skiing fast in the individual 20-km event! 01:42:37 Lowell Bailey — Finish! Just for reference, Lowell’s elapsed time of 48:07 minutes (with none of the 1-minute missed-shot penalties) means he skied on average at a speed of ~25 km/hr! This win came for him as a 35-year-old, after 18 years “on the circuit.” Prior to Tim Burke winning silver in this event in 2013, the previous best for an American was Josh Thompson who won silver at Lake Placid in 1987. 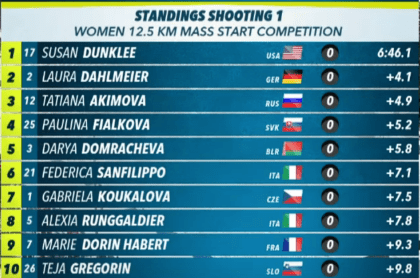 01:33:16 Johannes Thingnes Boe — Incredibly fast shooting round (4/5)! 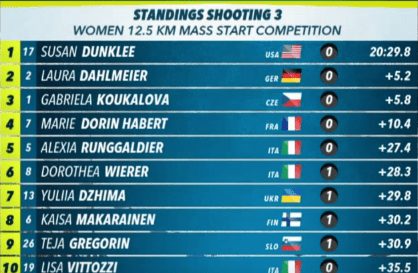 The 2017 Biathlon World Championships have just ended. They have been historic for the United States. 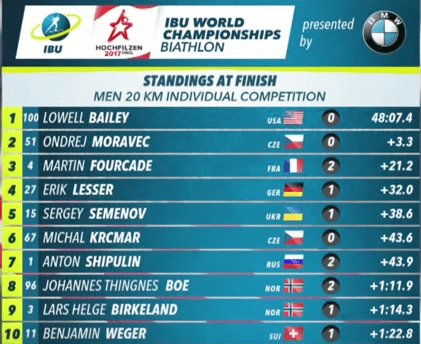 Lowell Bailey’s gold in the individual is a best ever for the USA…. 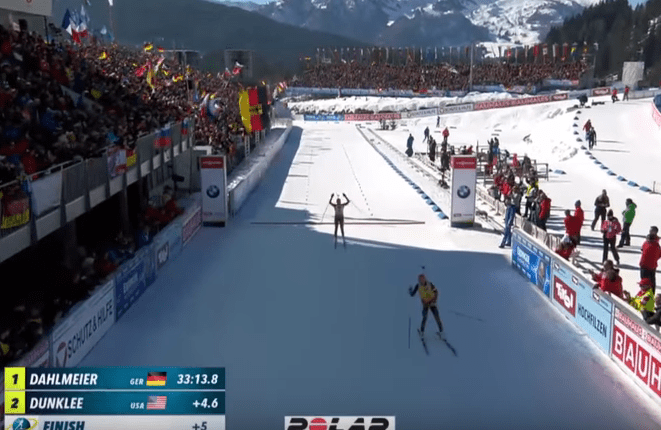 Whether it was the best peaking ever done for the USA or what, what happened with Lowell Bailey in Hochfilzen, Austria was an amazing performance by an amazing athlete. 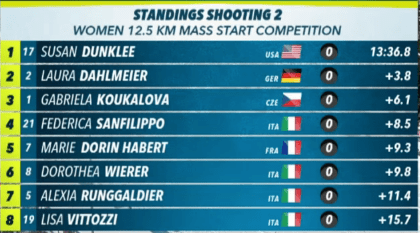 After Tim Burke’s rise to the top of the World Cup points list for a time in the very recent past all this bodes well for America and Biathlon. Bailey won the Individual championship, the first ever World Championship gold for the USA. An awesome feat. And appropriate, as the Individual was the original Biathlon event at the 1958 World Championships and the 1960 Olympics at Squaw Valley (Lake Tahoe), California, USA. But looking at Bailey’s overall results, it is even more amazing. Behind that great Individual format performance, Bailey was strong throughout these championships. 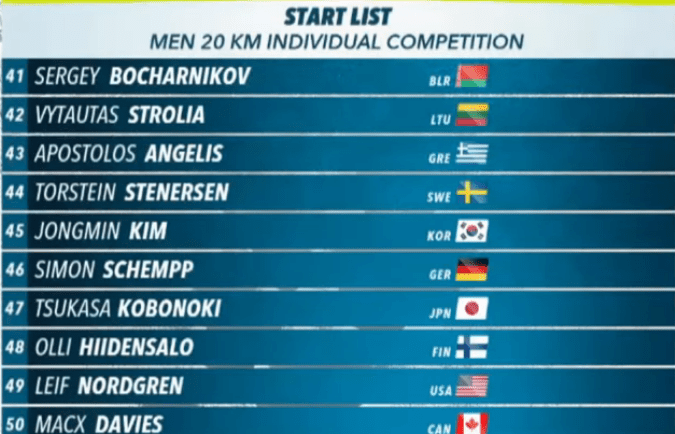 In the 10k Sprint he was fourth just 6.5 seconds off of a bronze medal. In the Pursuit he was sixth, just 9 seconds off a medal. 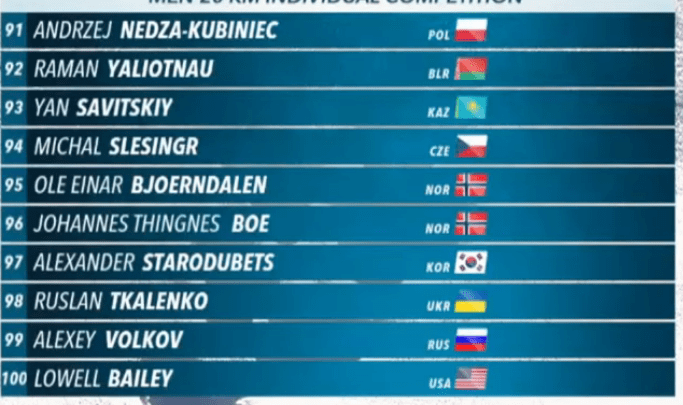 In the Mass Start he was sixth again, 10 seconds out of bronze. 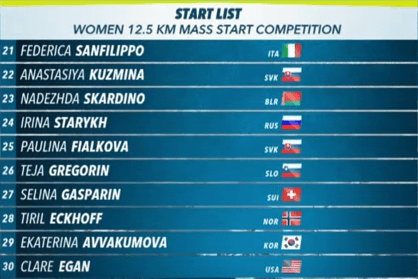 In the Relay, where the USA was seventh, Bailey posted the 18th fastest leg out of 104 legs. Bailey’s shooting in Austria was equally amazing. 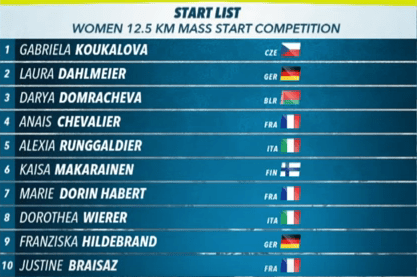 20 for 20 in the Individual. 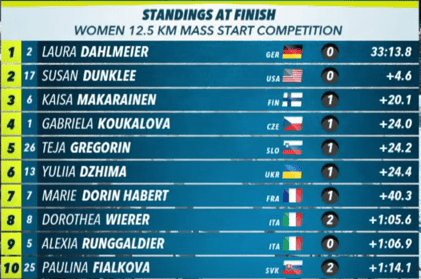 20 for 20 in the Mass Start, 19 for 20 in the Pursuit, 10 for 10 in the Sprint, 10 for 10, with one extra round in the relay and 10 for 10 with two extra rounds in the Mixed Relay. The Snoqualmie Loppet is a fun ski that typically takes place with non-organized friends on the last Sunday in January (e.g. Jan 29, 2017). 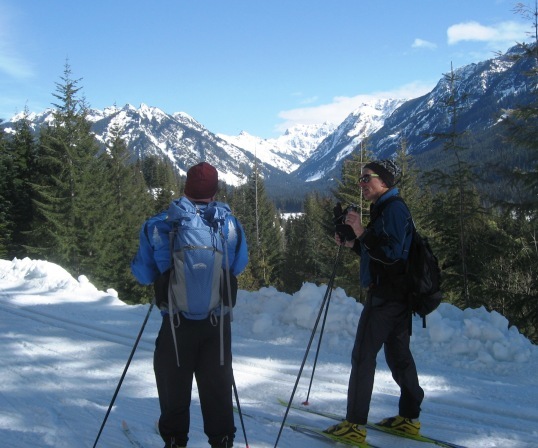 It is a 30-km nordic (classic or skate ski) tour that romps through almost all of the Snoqualmie Pass Nordic Areas, including: Summit Nordic Mount Catherine Loop; Iron Horse Trail; Troll Haegen Forest Loop; and Cabin Creek Viking Loop. 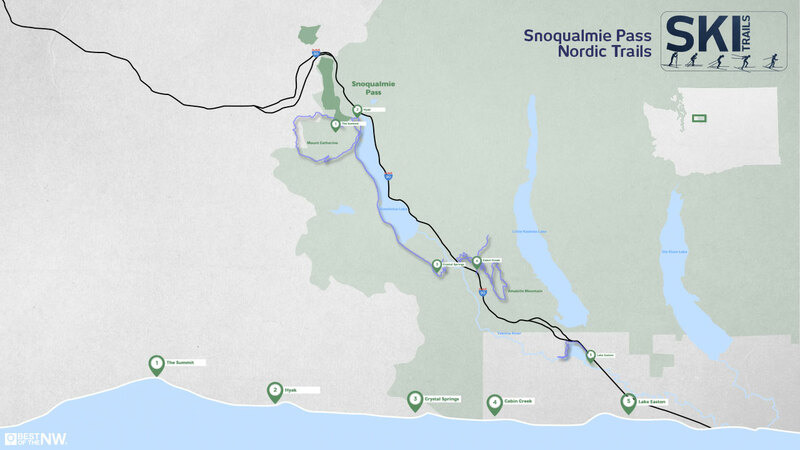 Here’s a fun video overview of the vicinity from a Best of the Northwest” page about nordic trails in the Snoqualmie Pass area. Give it a try! If the weather is right, you’ll enjoy great skiing and scenery, and if you start around 9 a.m. you might meet some like minded skiers. Faster Skiers will complete in about 3-4 hours. Slower skiers perhaps 5-6 hours. 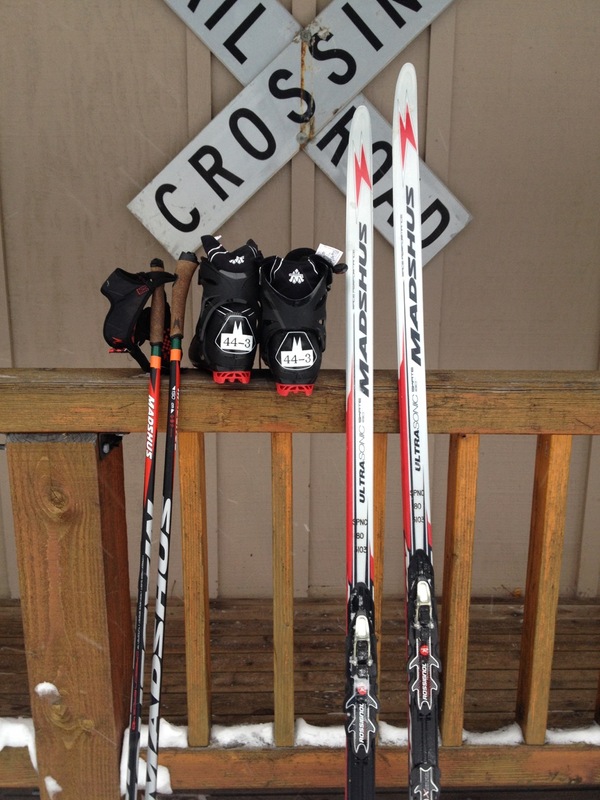 It depends on your gear, your technique, your wax, the weather, grooming conditions, and your physical ability. You can also do any of the sections if you are not up to full loppet (yet). In any case, be safe and have fun! 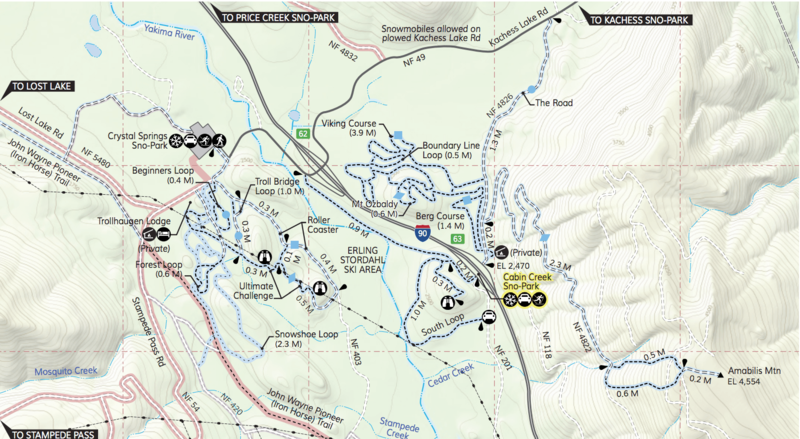 Below are some verbal, visual, mapped, and GPS-friendly descriptions of the route. 1. Take the Summit East, East Peak chairlift to the top and the upper trails. 2. Ski around Mount Catherine counter clockwise. First descend via “Snow Train” and “Outer Loop” to Grand Junction, then proceed along “Ripsaw” down and up to Windy Pass, and finally descend “Cold Creek” all the way back to Hyak Lodge (Old Milwaukee Lodge). 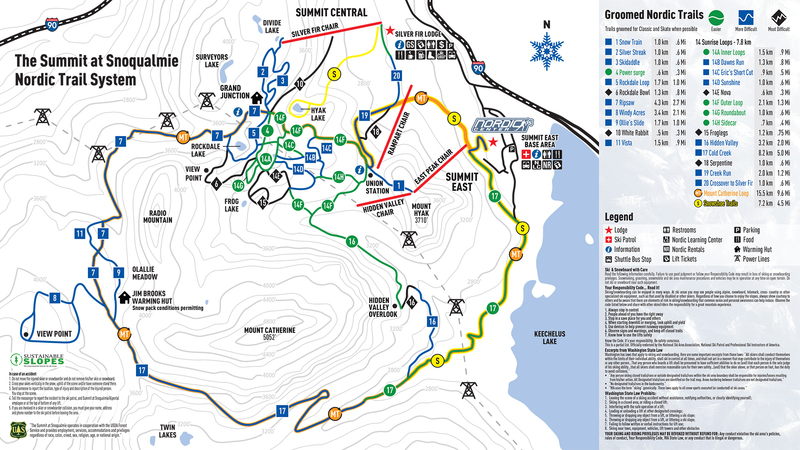 Refer to the Summit Nordic trail map below if you are new to the Mount Catherine loop. 3. 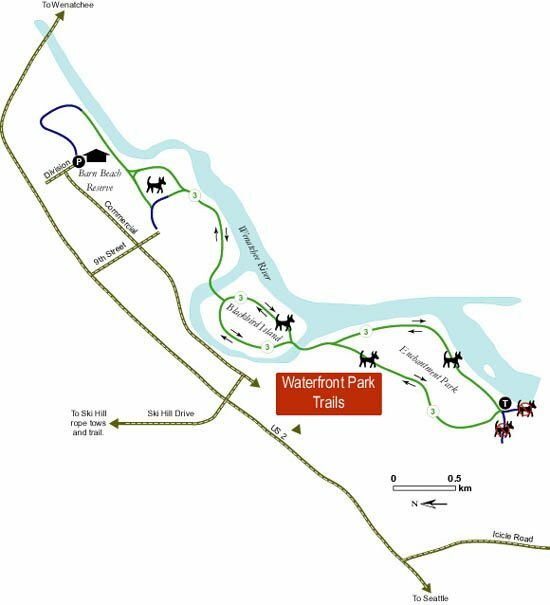 Descend via parking lot and a short block on residential street to the Iron Horse trail and the long fast 10 km to the Stampede Pass Road. 4. Turn left on the Stampede Pass Road, and after a couple hundred meters enter the Erling Strodahl trail system. Ski the Forest Loop. You can visit the Troll Hagen Cabin if you need water or restroom. 6. Walk the road (watching out for vehicles), or sometimes you can ski on the right side above the berm. On your right look for the Yakima River Trail (after the Yakima River bridge, but before I90). 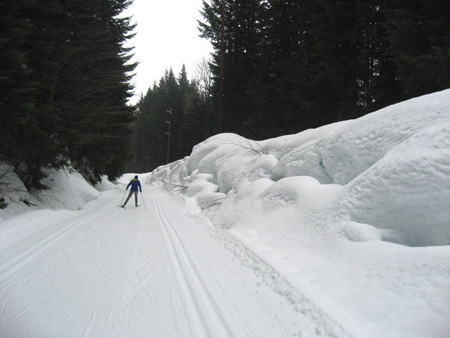 Ski on the Yakima River trail to the Cabin Creek parking lot, or if it’s not groomed you can walk across the I-90 bridge and thru the DOT yard to join the Cabin Creek trail system. 7. Enter the Cabin Creek Trail system. 8. Ski the Viking course and then merge on to the Berg course to the end! Cora getting ready to line up her next shot in a chilly crosswind. Each winter the WBA (Washington Biathlon Association) organizes a 2-day wintertime introduction to biathlon clinic at the Steven’s Pass Nordic Center. This event is open to all ages but is normally limited to ~20 participants. This year, however, there was so much demand that the Association was able to double enrollment by having one group learn about shooting the first day and skate-skiing the second day (normally the order is reversed). Since our kids have sufficient skating experience from the JNP (Junior Nordic Program), we only participated in the shooting clinic this year. Looking down the 50m range. The line up of students and instructors. Cora was assigned to Grete in lane 10, but Dave in lane 9 gave Cora some tips at the same time he kept Liam busy with both shooting and increasingly tough skiing challenges. Both volunteer instructors were great, both in the way they kept the kids active and motivated, and just for being cheerful and fun on a sub-freezing day without being able to be active enough to stay warm. It was indeed bitter cold, but as long as you kept moving and occasionally stood in front of the propane heater, there wasn’t too much suffering. The first hour or so included instruction about how to: load a magazine with 5 bullets; insert and remove the magazine; get in a good prone position with the rifle on a supporting block; find your natural point of aim; knock down some white dots; and re-set your targets. View down-range from the mat. Liam shooting without a glove! There was a brief break where some folks grabbed a bite to eat (normally it would have been a full lunch break, but folks were too cold to sit still). We chewed some chocolate while we walked out with Bryn for a quick orientation to how the targets work. By poking through the holes, we felt how much impulse it takes to knock a target down. We also saw up close the difference in diameters of the prone (11.5 cm) and standing (4.5 cm) target. By grabbing the pull line right next to the target, we got a feel for how a little tension resets the targets, while increased tension switches between target sizes. Then there were two fun races (no score was kept) where Cora and Liam zoomed around a short course between two rounds of prone shooting. Both seemed way into it and really focused when shooting. Cora managed to shoot clean a couple times and Liam was consistently knocking down 3-5, despite feeling a little frustrated. I re-loaded a bunch of magazines and tried to make sure the kids stayed warm enough. I did take Liam up on his invitation to shoot a round prone and a round standing. It was great having contacts instead of glasses (which fogged up badly when I tried a race 2 winters ago) but I think my right eye was still a bit blurry. Re-learning how to hook in the stabilizer strap will help, I think, because shooting standing in the gusting wind it was tricky to keep the sight aligned long enough to squeeze the trigger. In the end, we all packed up the range and headed back to the Nordic Center about 1.5 hours early. Liam zoomed ahead while Cora and I stopped occasionally to throw snowballs and whack snow off the tree limbs. It was delightful to enter the toasty center, re-hydrate, and try some of their fairly-healthy food options, including a baked potato, vegetable soup, and self serve hot cocoa, cider, and coffee. 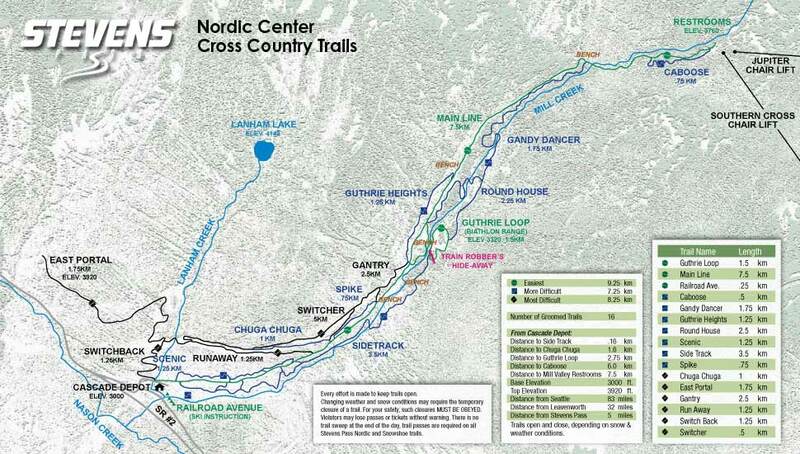 Since there are so few places to actually practice biathlon and to keep the cross-training process super-fun and positive for youth, here’s a guide to places in Washington State (and the Pacific Northwest vicinity) where you can hone your skate/skiing abilities — either on a trail or tour that’s fun for kids and/or in a system that allows dogs (e.g. for skijooring). Erling Stordahl is not dog-friendly, but has some fun loops for kids — both flat and pretty steep. Dog Power Trail 100 is located on the southwest side of the Sno-Park. 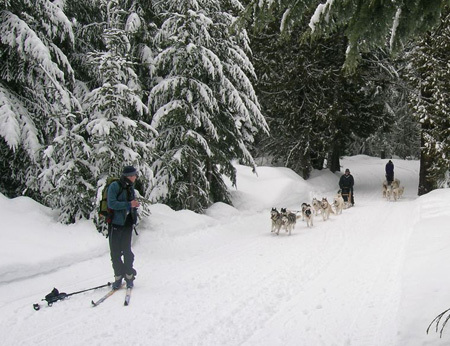 Separate parking is available for mushers and for non-motorized users who do not object to sharing the trail with dogs. This trail is approximately 1 mile long and terminates at Lost Lake Road, where users can access the Iron Horse Trail. NOTE: ALL DOGS MUST BE ON A GANGLINE or LEASH. There are no exceptions! If a team is needs to pass or is coming head on, rein your dog in and mover to the side of the trail and restrain your dog(s). This is NOT and OFF-LEASH area. Please also note that a Special Grooming Sticker is needed in addition to your Sno-Park Pass to use this area and trail. Connect Dog Trail to John Wayne, then go southeast past Stampede Pass Road until you can access the dog sled trail system below Meany Cabin. Lots of fun loops in there! Great conditions and varied trails for kids. Kongsberger Ski Club maintains the trails. Skyline Lake trail from new downhill parking lot. Not groomed, but dog-friendly. 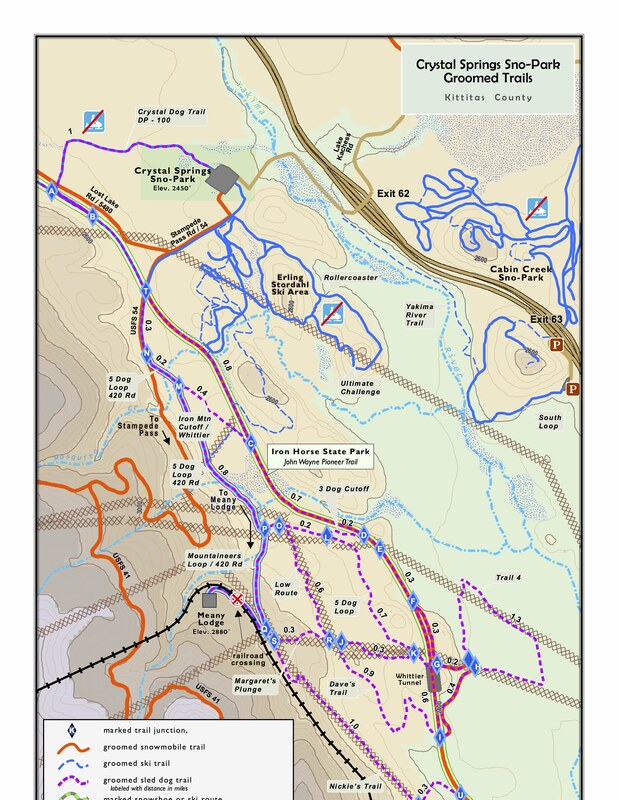 See Ski Plain link above for PDF map & conditions… or this nice overview of See N Ski trail. Methow Valley Sport Trails Association, www.mvsta.com, a nonprofit group that wove the network of trails on private and public land. Dog (off-leash!) groomed skating trails (~6 km total in valley [Big Valley loops; hatchery loop]; some Rendezvous huts)! WA State Park site with links for getting Discover Pass (day or annual) and Sno Park permits ($80/season), etc. 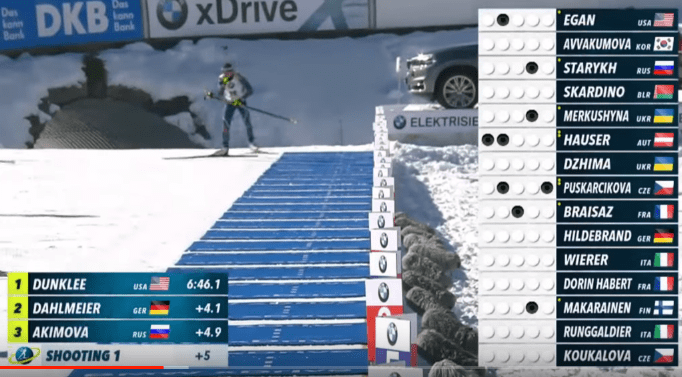 Here’s a Google spreadsheet listing ways to learn about or train for biathlon, with rough cost estimates. An affordable North American rifle for youth biathletes? Here’s a challenge for you. Define the best path to an affordable (<$500), accurate (<1 m.o.a. out of the box) rifle that would make it easy for the many excellent young cross-country skiers in the United States to become competitive biathletes. As a bonus, ensure the rifle and accessories are manufactured in North America! 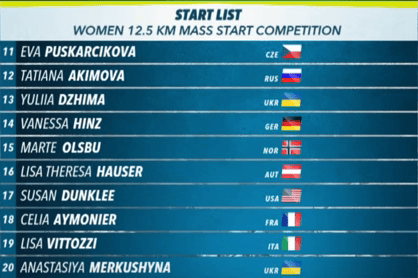 The long-term goal of this challenge is to lead the U.S. down a path towards an Olympic medal in biathlon. 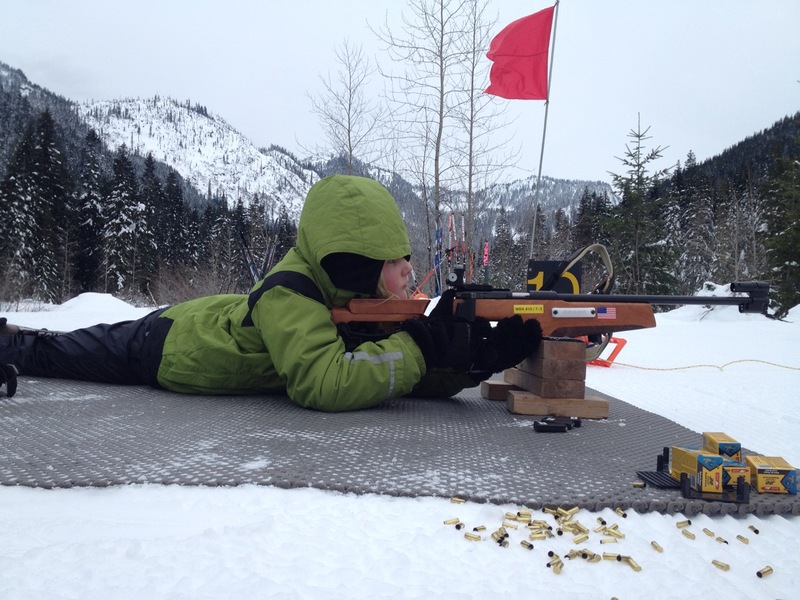 A shorter-term goal is to find a way for the fast young skiiers based in the greater Seattle Metropolitan area (and trained up through the Junior Nordic Program and Snoqualmie Nordic Club) to pose some sort of challenge to the Mazama Valley youth biathletes in the next 5-10 years! Let the comments begin! Any expert members of the Washington Biathlon Association want to chime in? The big advantage of this bolt-action .22 is that it is has peep sights and high accuracy out of the box. Since kids less than 14 years old only shoot prone and don’t carry their rifles in WBA races, this rifle just needs a case and a sling to be youth-race ready! Snow covers, harness, extra magazines, blinders, and other accessories can be acquired later, perhaps as the biathalete nears their 14th birthday. If you want to convert it to a biathlon rifle suitable for being carried and shot standing, you can buy a stock and/or snow sight covers from Eastern Sierra Armory which also offers the Savage Mark II as a biathlon rifle (for ~$1300) using the barrel/action/trigger on their custom biathlon stocks. The Mark II is know for its sub-1 m.o.a. accuracy out of the box. Here are some FVT accuracy data taken with various ammunition types acquired by Sergey of Precise Shooter (based in Queen Anne neighborhood of Seattle). #4) Eastern Sierra Armory G3C? A great American effort to build a complete competitive biathlon rifle, but for youth they are unfortunately in the same price range as Ishmazt.